Another well-known Senate Democrat hays he will vote against the nuclear deal with Iran, making Congressional passage look even more uncertain. 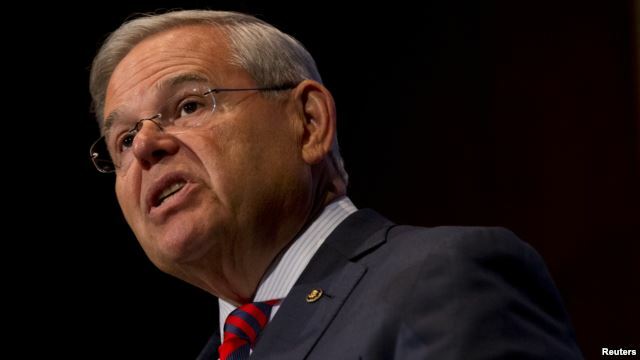 New Jersey's Robert Menendez said in a speech Tuesday at Seton Hall University that he believes the deal will leave Iran with what he calls a "the core element of a robust nuclear infrastructure." "If Iran is to acquire a nuclear bomb, it will not have my name on it," Menendez said. "I will vote to disapprove the agreement and, if called upon, would vote to override a [presidential] veto." Menendez said President Barack Obama is wrong when he says the deal will permanently stop Iran's nuclear program. The senator said Iran has broken past promises to give up its nuclear ambitions. He also said the agreement only shrinks Iran's nuclear infrastructure, not dismantle it. The speech by Menendez, a strong backer of Israel, contained a detailed, technical analysis of the agreement. He pointed out that throughout Obama's term in office he has mainly backed the Democratic president, voting for Wall Street and healthcare reforms and other major initiatives. Menendez, however, has parted ways with Obama over his opening of diplomatic ties with Cuba and he questioned Obama's threats to ultimately take military action against Iran if it went ahead with making a nuclear bomb. "We should authorize now the means for Israel to address the Iranian threat on their own in the event that Iran accelerates its program and to counter Iranian perceptions that our own threat to use force is not credible," he said. He also criticized Republicans, who he said "reflexively oppose everything the president proposes." Menendez urged the Obama administration to go back to the negotiating table to rework the main elements, something the Obama administration says would be impossible. Last month, New York Senator Chuck Schumer, the third-highest ranking Democrat, said he will vote against the nuclear deal and will try to persuade other senators to follow him. Obama has promised a veto if the House and Senate vote against the nuclear deal next month. It is unclear if Congress has enough votes to override the veto. The agreement reached between Iran and five major world powers -- Britain, China, France, Germany, and Russia -- requires Iran to scale back its uranium enrichment to keep it from building a bomb, and open its military sites to international inspectors to ensure compliance. In exchange, the six powers would ease sanctions that have wrecked the Iranian economy. Backers of the deal call it the most robust nuclear agreement possible. Opponents, including Israel, say it still gives Iran room to build a bomb and strengthen what they call a terrorist state. But a group of arms control and nuclear nonproliferation specialists have endorsed the agreement, calling "strong, long-term, and verifiable,"
The Washington-based Arms Control Association said Tuesday the deal "advances the security interest of the...international community." It says "any future effort by Iran to pursue nuclear weapons, even a clandestine program, would be detected promptly." Among the more than 70 signatories in support of the agreement were the former head of the International Atomic Energy Agency Hans Blix, and John Ahearne, former chairman of the U.S. Nuclear Regulatory Commission. It also was endorsed by former U.S. and U.N. officials, as well as dozens of members of groups aimed at preventing the use of nuclear weapons.